190679026 –What is cultural anthropology, and how can it explain–or even help resolve–contemporary human problems? 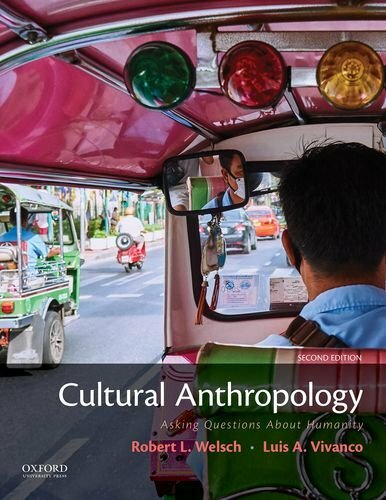 Robert L. Welsch and Luis A. Vivanco’s Cultural Anthropology: Asking Questions About Humanity, Second Edition, uses a questions-based approach to teach students how to think anthropologically, helping them view cultural issues and everyday experiences as an anthropologist might. Inspired by the common observation that ninety-nine percent of a good answer is a good question, Cultural Anthropology combines a question-centered pedagogy with the topics typically covered in an introductory course. It emphasizes up front what the discipline of anthropology knows and which issues are in debate, and how a cultural perspective is relevant to understanding social, political, and economic dynamics in the contemporary world. Cultural Anthropology also represents an effort to close the gap between the realities of the discipline today and traditional views that are taught at the introductory level by bringing classic anthropological examples, cases, and analyses to bear on contemporary questions.